Long before the death of 25-year-old Freddie Gray, who succumbed April 19 to injuries his family says were sustained while in police custody, Baltimore’s Catholic institutions had been grappling with the issues illuminated nationally by this most recent tragedy. He stressed that he was not condemning the police. “Honestly, 99 percent of the time they’re there to help, but that one percent is potentially lethal, and that’s why we can’t ignore it,” he said. Deacon Turner actively maintains a dialogue between the mostly African-American students at his high school and Baltimore police. It is not uncommon to enter the school building on E. Chase St. near Greenmount Ave. and see five uniformed police inside. “They’re in here at least once a week now,” said Deacon Turner, who recently established a Baltimore Police Department Explorers group at the school, with assistance from Lt. Col. Melvin Russell, head of the police department’s Community Partnerships Division. Students in the Explorers program “explore” the possibility of one day becoming city police officers. Equally importantly, Deacon Turner said, the youths establish meaningful relationships with police officers. Dr. Samuel Ross, CEO of Bon Secours Baltimore Health System, concurred. Vincentian Father Eugene Sheridan, pastor of two parishes – Immaculate Conception and St. Cecilia – within two miles of the scene of Gray’s arrest, said that his homily of April 19 had touched on the “fear rather than trust” evident in the relationship between some city residents and the police. 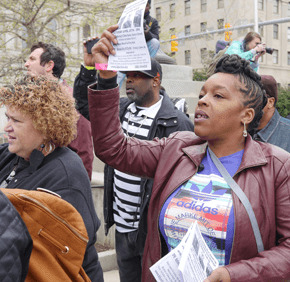 At that point, Father Sheridan had not yet heard news of Gray’s death, but on April 16 he had attended a forum at Coppin State University sponsored by the U.S. Department of Justice to discuss residents’ complaints against the Baltimore Police Department. Father Sheridan expressed the importance of prayer – as well as action – in the face of all violence. “I do believe Christ is the one who has conquered these things, and we need to connect with him,” he said. On April 23, a group of faith leaders that included the Baltimore Interfaith Coalition, co-chaired by Bishop Denis J. Madden, issued a statement on the “current crisis” in Baltimore. The faith leaders offered condolences to Gray’s family and friends, and prayers for all involved in the tragedy, including Mayor Stephanie Rawlings-Blake, Police Commissioner Anthony Batts, the six officers suspended pending the investigation, and Gray himself. A wake will be held for Gray April 26, 1-6 p.m., at the Vaughn Greene Funeral Home at 4905 York Road in Baltimore. His funeral service will be April 27, at 11 a.m., at New Shiloh Baptist Church, 2100 N. Monroe St., Baltimore. Assistant Managing Editor Paul McMullen contributed to this article.